Click on the name of an airline to show in-flight reviews, sorted by cabin class and ordered by date. The American Advantage loyalty program offers a mileage cost for redemptions that is often less than half of BA Executive Club; Award seats also don’t involve the addition of spurious ‘carrier surcharges’. Most importantly: this is by far the best mileage program to use for redeeming flights on Etihad apartments. With the introduction of a new fleet of Boeing 789 Dreamliners, Air Canada now offers one of the best seats of any airline in business class. First Class to myself, in the nose of an Asiana Boeing 747 ! The gold standard for service. No other airline is as unbelievably OTT with the deferential politeness of its crew. Want to be given a hot towel, on the way back to your seat, seconds after washing your hands in the bathroom… in business class? Asiana is the airline for you. Bonus points for handing out free wads of dollar bills to First Class pax during check-in. 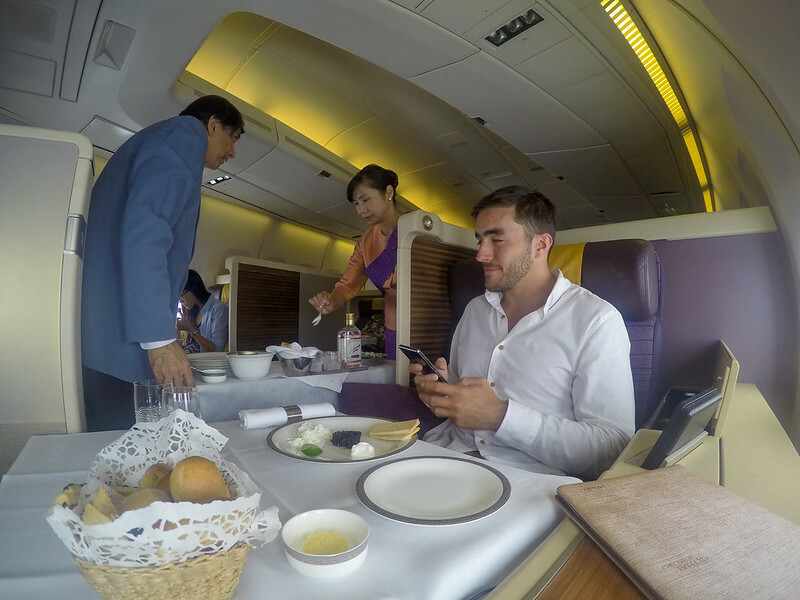 Asiana is also one of the select few airlines that offers fully enclosed suites in F (aboard their A380). British Airways, my home carrier. Gifted with a captive market at one of the busiest airports in the world, BA is an airline whose star has fallen of late. Wave after wave of cost cutting has done real damage to the reputation of what was once a market leading brand. Having said all of this, First Class on the A380 presents a seat which is bigger than the market average, with finishes that are market leading. The wine list in First is also particularly strong. Finally, the crews on BA have the potential to be exceptional. When they are good, they are some of the very best around. ANA are one of the two main airlines in Japan (alongside JAL). Both airlines are exceptional although ANA has the slight edge in my opinion. 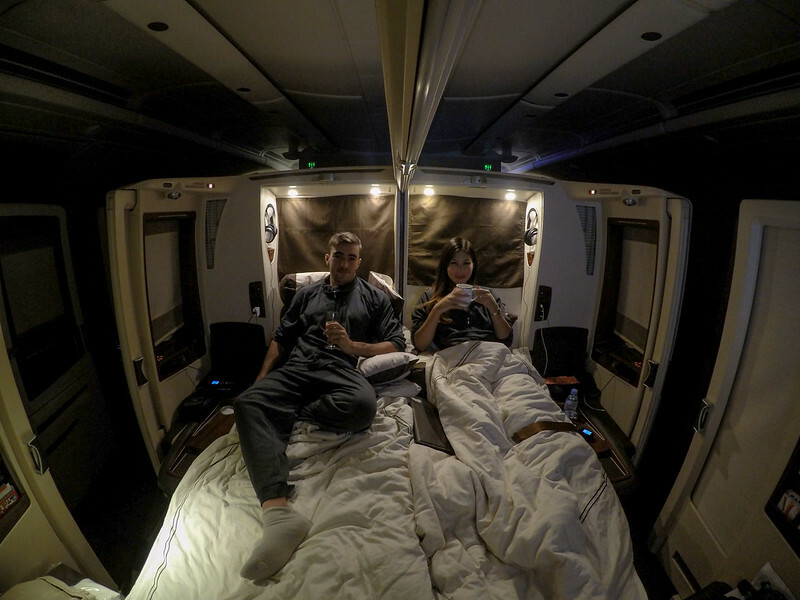 One of the best meals I’ve ever eaten in my life took place within the confines of ANA First Class… a meal which was immediately followed by a deep sleep on a memory foam mattress, with an organic cashmere blanket. Cathay Pacific is one of the top airlines in the world and a founding member of the OneWorld Alliance. The Hong Kong based carrier is famed for the quality of both its enormous First Class seats and the spectacular array of lounges in HKG. Long haul business class features aisle access for all passengers although the quality of the on-board food has come under fire as of late. A real surprise of an airline. A Fantastic lounge in its home airport of Guangzhou (CAN) with private buses for premium passengers, a modern fleet including A380s and A330s with all aisle access in Business class, kind and gracious service and delicious food and drink. One of the members of the ME3 (Middle East 3) alongside Qatar and Emirates. For a long time it lacked the dazzling starpower of Emirates’ First Class, something which was rectified by the acquisition of a number of A380 aircraft, featuring apartments in First Class. The Etihad apartments are in my opinion the greatest product in the history of commercial aviation. The photo above shows our two apartments with the divider dropped, to make something similar in size to a Tokyo hotel room. Etihad’s business class studios on the A380 are quite possibly the best business class seat in the world as well. Whilst Etihad isn’t technically a member of any alliance, it has bought large stakes in a number of European carriers (including Alitalia, Airberlin and Air Serbia) and also offers reciprocal earning and burning of miles with AA. Very much an ‘under the radar’ airline, although if you know of it, chances are it will be as a result of its Hello Kitty jets. 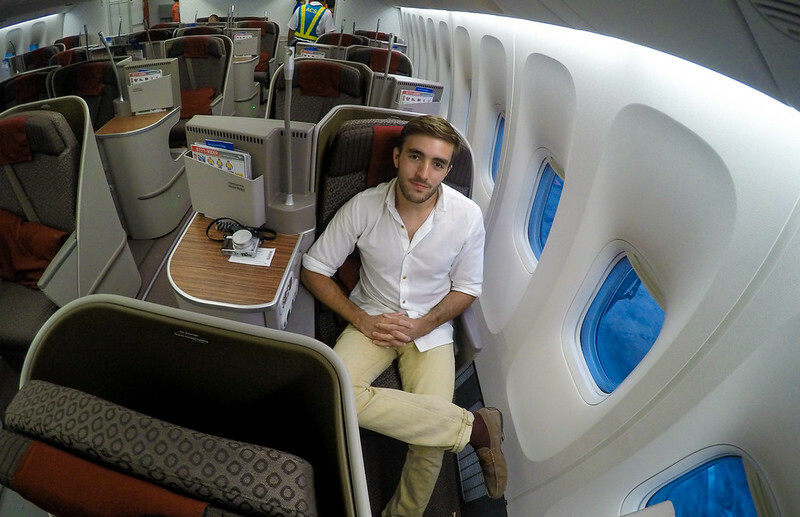 Its Business Class is absolutely one of the top 3 in the world. 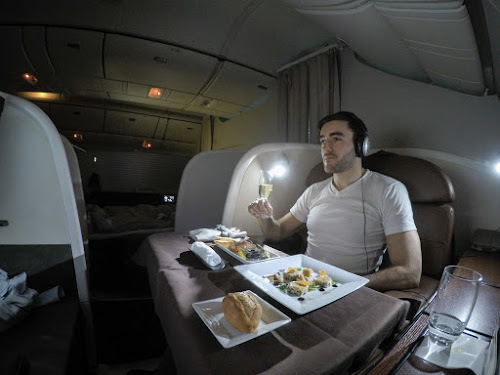 Where else would you find direct aisle access for all passengers; Krug and Dom Perignon champagne, PJs and slippers; Fiji water and 7 course meals? Far more of a premium experience than its advertising and drab, green upholstery would have you believe. One of six airlines rated as 5* by Skytrax. Garuda is an airline that has engineered an impressive reversal of its fortunes in recent times. The modern long-haul fleet, featuring A330s and B777s offers a very comfortable business class experience, with warm and effusive service. Japan’s flag carrier, I liken stepping aboard their planes as entering a microcosm of Japan. From the moment you step aboard, the bowing and hot towels begin. The service is very sincere and endearing, JL flight attendants will often go out of their way to write small notes or give gifts to First Class passengers: something which would be entirely alien on a non-Asian carrier. The food is exceptional: Caviar, Wagyu beef, foie gras as well as full Japanese Kaiseki tasting menus. The Red Roo, one of the most fun and friendly airlines to fly with. Just the thought of setting foot on a Qantas plane makes me smile. The crews are highly competent as well as being very engaging and funny. The food in Business isn’t the best but really shines in First Class. The wine list is exceptional across the board though, a particular mention has to go to the selection of prestige cuvées available on board: Pol Roger Winston Churchill, Veuve Clicquot La Grand Dame and Taitinger Comtes de Champagne. Qantas lounges are also some of the most consistently high quality of any airline. A member of the ME3 (Middle East 3) alongside Emirates and Etihad. Qatar is an airline that has experienced phenomenal growth in recent years. It has an ultra-modern fleet of A380, A350s and Dreamliners, all of which feature a jaw-droppingly beautiful Business class seat. A seat to which the food, beverage and service are definite equals. Qatar’s home airport in DOH is one of the newest in the world and also offers its fliers two of the most spectacular airport lounges around. Synonymous with luxury and quality. The national airline of Singapore is always pushing the envelope with its in flight product. SQ was the first airline to take delivery of the World’s largest airplane, the Airbus A380. The First Class Suites were the first ever to feature high walls and closing doors and are still as mind-blowing today as when they first made their debut in 2008. 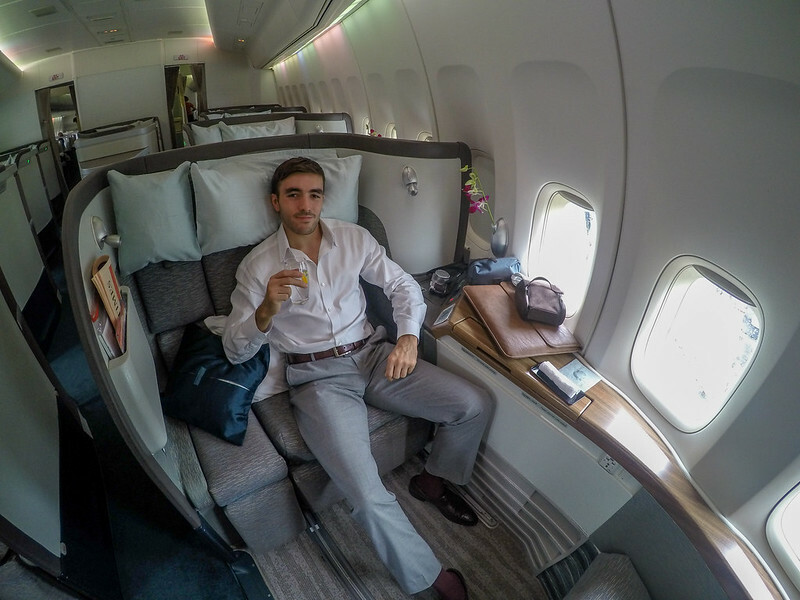 The Business Class seat on the A380 and the newest 777s is better than First Class on most airlines. In my personal experience, Singapore’s crews are consistently the best in the world. An airline for which it is almost impossible to redeem miles for First Class. Even when paying cash for a ticket, one must be careful to strictly adhere to unpublished ticketing conditions, or face being denied entry to the ultra-exclusive First Class lounge. Where other airlines are touting the fact that they fly the latest fuel efficient A350s and Dreamliners, Swiss only took delivery of their first 777s in 2016. The business class product is very highly rated though and offers a number of special ‘throne’ seats in each cabin, which feature two large worktop surfaces either side of the passenger. Famed for its ground services at its home airport of Bangkok, where F passengers are driven around the airport in buggies, allowed to use the diplomatic immigration channel, assisted with their luggage all the way to the curbside and offered an hour-long complimentary massage whilst waiting for their flights. In Business Class the service and food are a little more mixed however. Thai refurbished its 747s in recent times, which means there’s plenty of juice left in them yet. This is great as the nose of a 747 is just about the best place to spend time in the air. An airline which has always presented itself as the fun alternative to ‘stuffy old’ BA. The Upper Class (Business) experience from booking to landing is definitely far more exciting and entertaining than with VS’ domestic rival. Form the home base of LHR you get: a private arrival terminal with private check-in, a dedicated private security channel, one of the best lounges in the world and planes with friendly crews, dine-on-demand and on-board bars. The seats in Upper Class are quite dated though as are VS’ gas guzzling fleet of A340s.